Person - contains basic demographic information (name, gender, DOB) about a person in the EMR. Patient - represents a patient; has a 1:1 relationship to a Person object. Provider - represents a health care provider (nurse, physician, community health worker); has a 1:1 relationship to a Person object. Facility - represents a clinic or other health care facility. 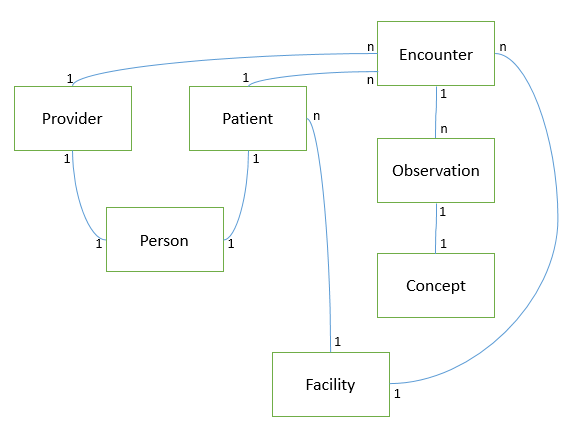 Concept - an individual data point or question collected from patients (e.g. blood type or eye color). OpenMRS provides detailed documentation for their concept dictionary; we’ll develop only a very limited version of it for this demo. Encounter - represents a provider’s encounter with a patient, and has a 1:n relationship with the Observation entity. Choose your adventure (code or UI) and let’s get started!